In a sure sign that the 2016 election cycle is now in full swing, Democratic voters in California's Seventh Congressional District received what is believed to be the first post-Labor Day mailer yesterday. The mailer, titled "Dr. Ami Bera is listening to Sacramento County," was sent by the California Democratic Party. Bera is seeking his third term in what is again expected to be one of the costliest and closest Congressional races in the country. The tri-fold mailer includes the Democratic Party talking points including ensuring care for Veterans and protection of Social Security and Medicare. 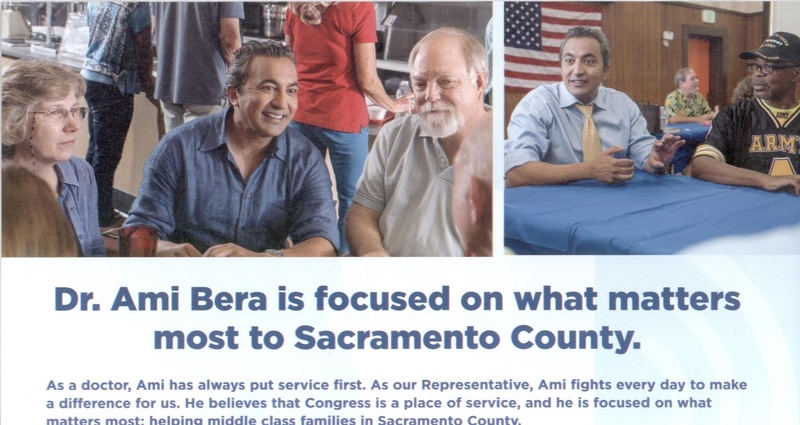 The mailer also attempts to personalize the Elk Grove-based Congressman by saying things like "As our representative, Ami fights every day to make a difference for us." Earlier this week Bera' Republican opponent Sacramento County Sheriff Scott Jones released a TV commercial that will air on local TV. In that spot, Jones' emphasizes immigration through the prism of public safety. With two months to election day, both candidates as well independent expenditure committees will undoubtedly bring out negative ads. Jones and his loyalist will hammer away on the recent conviction of Bera's father for election fraud, while Bera's side will remind voters of the recent multi-million dollar harassment lawsuit settlement awarded to four female deputy sheriffs with the Sacramento County Sheriff's Department.